I grew up on the I, Robot books and I can't believe they would do such a thing. Still this isn't surprising as everyone is money grubbing nowadays and has no care for the legacy the author created. Those "authorized" Foundation books were crap though. 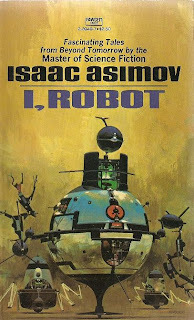 In fairness, Asimov was happy enough to let other authors play in his universe when he was alive, such as Roger Macbride Allen's so-so Inferno trilogy set on a Spacer world in the later Robots setting, and Reichert is actually a pretty good author (certainly a better writer than Benford, whose FOUNDATION novel was appalling). It's entirely possible he'd have been okay with this when he was alive. However, I agree (as the author of the linked DUNE article) that if you're going to be tackling a key character from the series (and Calvin qualifies as that) and such a key event, it's really necessary to have the approval of the author himself to give it some legitimacy. Otherwise it's nothing more than glorified fanfiction.